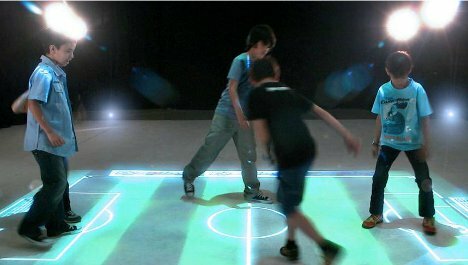 Projection-based interactive flooring is getting to be a more common sight with every passing year. Today, plenty of buildings like banks, museums, zoos and restaurants feature these moving, responsive underfoot phenomena. A company called EyeClick takes the concept a bit further with their EyePlay series: a bunch of interactive games that encourage kids to move around without making a big deal of the fact that they’re getting exercise. The EyePlay system comes with games that let kids (and adults, too!) kick around a soccer ball, pop bubbles, play a piano, defend birds’ eggs, stomp naughty mice and a bunch of other fun activities. The only equipment needed is the EyePlay projector, which turns any open floor space into a game area. There are some educational games too, like the one installed at NASA’s Kennedy Space Center visitor center. 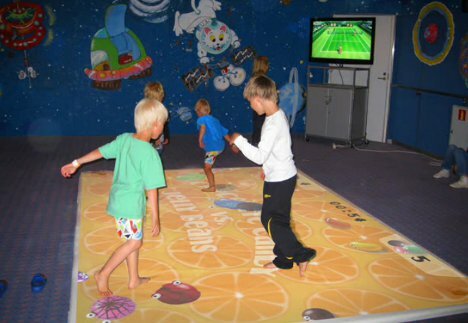 Up to 15 players can participate on the EyePlay game surface at once, making for a pretty wild gaming experience. The system has already been installed in public places like hospitals, airports and department stores all over the world, making us feel kind of cheated that this type of thing didn’t greet us in boring waiting rooms when we were kids.